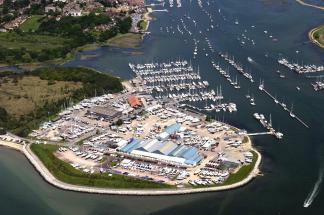 Hamble Point Yacht Charters’ office is next to the Ketch Rigger, overlooking the boats in Hamble Point Marina, which is located at the mouth of the River Hamble and has immediate access to Southampton Water and the Solent. The postcode for your Sat Nav is SO31 4NB. From the M3 take the M27 Eastbound for Portsmouth. From the A3, take the M27 Westbound towards Southampton. Exit Junction 8 of the M27 for Southampton East/Hamble-le-Rice. Follow signs for Hamble on B3397, Hamble Lane. After approximately 3 miles you will see a small sign for Hamble Point Marina, just past the Fire Station (on the right). Turn right into Copse Lane and continue straight on into School Lane and through the wooded area. Hamble Point Marina is at the end of this road after approximately one mile. Bear left as you enter the marina and park in the vicinity of the Ketch Rigger pub. Our office is adjacent to the rear of the pub facing the river. From Gatwick, take the train to Swanwick or Southampton, both are a 20 minute taxi ride from Hamble Point.